The mighty Mekong, south east Asia’s great river, flows through several countries and over numerous borders including those of China, Thailand, Cambodia and Laos before emptying into the South China Sea in southern corner of Vietnam. It is the massive delta and it’s many river branches that makes up Vietnam’s portion of the Mekong; the Mekong Delta. The Vietnamese call the delta đồng bằng sông Cửu Long or basically the river delta of the Nine Dragons, referring to the nine forked branches that empty into the sea. The region is a vital transport route, including into Cambodia and beyond, and is a major fruit and vegetable producing area, forming essentially the “bread basket” of the region. More appropriately I guess you would call it the “rice basket”, particularly as over 50% of Vietnam's rice originates in the delta region. The Song Saigon or Saigon River – that Ho Chi Minh City sits on, is not part of the Mekong system, despite many tourist brochures that will infer otherwise. This river rises inside Vietnam, unlike the mighty Mekong which begins its journey from the Tibetan Plateau, and then in fact empties into the sea only 10 miles north east of the Mekong Delta, whilst still remaining geographically distinct from the delta. The Mekong Delta means many things to different people. Like so much of this region I find it hard not to associate things with scenes from iconic, usually American War related Hollywood movies. I can’t think of the Mekong Delta without hearing Wagner’s Ride of the Valkyries and seeing river gun boats and flying Huey helicopters a-la Apocalypse Now. But if you think you are going to be deep in the rainforest whilst exploring the delta today you’d be wrong, as like much of the rest of Vietnam, it is heavily populated and heavily industrialised. The produce that comes out of the delta is first class, abundant and tasty. Pineapples, citrus, melons, leafy greens, dragon fruit, you name it. If it grows in the tropics it’s probably being grown and sold out of the delta. 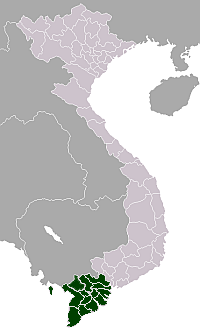 The region supplies much of southern Vietnam with its fresh produce. Along the various branches of the river you can visit farms and market gardens and see the produce and of course the river itself is the major traffic route for this fruit, with large floating wholesale markets selling onto to smaller retail floating markets. Having lived and worked primarily in the tropics all of my life, most tropical fruits I come across I have seen before. Most can be purchased in my local market itself, Rusty’s. Things like the Dragon Fruit that I mention in the above photo are recognisable to many around the world now, being widely available in major supermarkets in developed nations. Other fruits, whilst recognisable to me, are less well known to the masses. Fruits from the Syzygium family go by many common names; lillypilly, malay apple, water apple, lau lau, rose apple and many more. The bell shaped crisp fruits have an apple like texture and abundant watery sweet juice. I am not sure of the exact species growing on the Mekong but they taste good! A fruit at the floating markets that threw me initially was being called Milk Fruit by the locals in English. I guessed it was Sapotaceae family by the shape and texture, when I got a chance to google it, the first hits told me it was a star apple, Chrysophyllum cainito, but this particular fruit definitely was not what I recognised as a star apple. Star Apples have always been purple to me with a distinct star pattern when dissected. A little bit more research showed me that this variety, known as Lò Rèn, was usually green or red but not purple. I also learnt that the Chinese, long time masters of fruit growing manipulation, had created a rainbow coloured variety. The flesh is sweet and creamy somewhat like a custard apple, it does taste different to the regular star apples I am use to, but it’s equally as good if not better. Interesting like the Dragon Fruit, the Star Apple/Milk Fruit originates in Central and South America and was introduced to the delta. Vietnamese Milk Fruit showing the sweet milky flesh. At first this fruit threw me, google and wiki told me it was a Star Apple, but it was the wrong colour. Then I learnt in Vietnam they had green ones. But where was the tell-tale star pattern you see when you cut the fruit in half? Then I realised I had cut the fruit the wrong way to see the star pattern! The next one to throw me off was the so called “Water Coconut”. Any half decent botanist knows there is only one member of the coconut family, even with variations such as the Dwarf Malay and the Filipino Macapuno, there is still only really one coconut. Yet here I was being told about the Mekong’s “special” Water Coconut. I asked to be taken to see one, and was surprised to find the local common name “Water Coconut” was in fact the Nipa Palm, or more specifically the fruit of the Nipa Palm. The Nipa grows all over the Asia-Pacific, commonly used for thatching, and for making liquor from the fruits, and of course eating the sweet translucent fruits themselves. The Nipa Palm is the only palm tree considered to be a mangrove species. Also abundant in the delta is my beloved Calamansi. Worth noting I have given up trying to distinguish between Cumquats and Calamansi and the seemingless never ending varieties of cultivars inbetween. Considering nurseries in Australia sell Calamansi cultivars as “Australian Cumquats” and I have seen Filipino market gardeners in Australia growing the things, arguing over what is a Calamansi and what is a Cumquat, if it’s a small citrus, with a tang, I now call it a Calamansi, period. I suspect botanically the Mekong versions are closer to the Cumquat then a Calamansi, but hey, they’re all Calamansi to me now! Interestingly I found that in Vietnam, and no doubt other nearby Asian nations, for the Lunar New Year Calamansi/Cumquat trees are used as a symbol of luck and prosperity. There’s more action on the river than in the city itself. Large wholesale vendors advertise their produce by hoisting it on a long pole; here you can see a cabbage on the top of the pole. They don’t bother with written signs as many of the simple village buyers can not necessarily read any way.